How to get on the First Page of a Google Search or…Does it Matter if You Show Up on the First Page of a Google Search? These days, everyone is jumping on the Internet bandwagon. Everywhere you turn there are Internet-based businesses, applications, and books (guilty as charged!). And for good reason. The Internet is the future of marketing. Its ever-changing landscape is creating new and unique opportunities for astute marketers to seize market share and interact more closely with their target audience. But like all bustling hubs of activity, it’s a crowded and noisy place. For your site to be heard above the din, it has to be in a position of authority, highly visible in the public eye. Ignore your web strategy and your site will get lost in the crowd. Savvier sites will race to the top-ranking spots while you’re tucked away on page ten, sipping tea with all the other practitioners who thought their reputations were strong enough to sustain (and grow) their businesses. At least you’ll be in good company. In the early days of the Internet, simply having a website was sufficient to get you noticed—the flashier the site, the better it served you. But the days of “build it and they will come” are behind us. Where style once ruled over substance, ranking now reigns supreme. That is where search engines come into the picture. When someone does a search for “any item”. Google returns a list of websites, ranked by relevance, and sorted by type (paid advertisements above the organic, or natural, results). It’s called the search engine results page (SERP) and, in the race to capture market share, where you rank directly correlates to the number of people who visit your site. In fact, it determines whether your site registers on their radar at all. Let’s be clear: ranking high on the first page isn’t just important. It’s everything. Numerous studies have shown that clickthrough rates—the number of people who click on the link to your website from the Google results page—depend almost exclusively on where your page ranks in that list. A study by the search engine optimization practice Slingshot SEO found that more than half of search users click on an organic result on the first page, and among those, more than half choose the first or second link. Clickthrough rates fall from 18.2% for the first result to 10.05% for the second, and just 7.22% for the third. Rank seventh and it drops to under 2%. Previous studies reported an even shallower curve. In other words, the lion’s share of search traffic goes to the first five websites listed in the organic search results. If your site is not in the top 20, it’s basically invisible. The quickest way to the top of the page is paid results, or SEM (search engine marketing). For a monthly fee, you can pay the search engines to list your link when someone types particular words into a search query and own real estate at the top of the page or down the right side. (This area is sometimes referred to as the “Golden Seven” because of the light yellow box around the sponsored links.) Technically, it’s more of a timeshare, but we’ll get to that in a later chapter. Paid ads may guarantee placement, but it’s not the most effective route unto itself. Most people, and particularly those with a higher level of education (aka: your customers), click on organic search results, not the advertisements. The reason is simple. Who are you going to trust more: the company trying to make a sale, or the search engine tasked with finding the information you need for free? Good search engine optimization allows search engines to find relevant content. Without it, good content that deserves to rank is invisible all over the web and will remain that way. 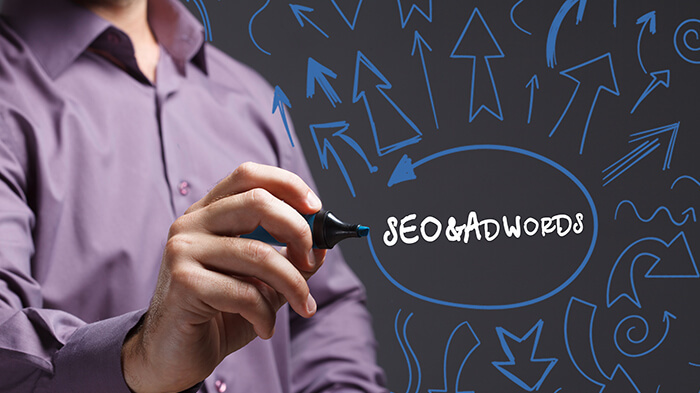 For most Companies, SEO is the most vital tool in your Internet marketing strategy. Accept too that SEO is not a one-time event. Google and the other search engines will continue to tweak their algorithms. Last year it was Panda. Shortly after that came the Caffeine, or freshness, update (it rewards “fresh” content). Then it was Walrus (it devalues sites that have a lot of ads on the top half of the page). With these changes come new opportunities to play the system as well, an issue Google has struggled with since day one. Panda thinned out thin content. Other changes will be required to correct new issues that arise as new weaknesses are exploited. At the same time, the Internet is constantly growing and evolving. Different types of media will emerge and create new challenges that will require still more updates. There’s no telling what animal, beverage, or insect-themed updates are next in the Google pipeline. You need to stay in the loop. As sure as the sun will rise and wrinkles will appear, you can count on having to tweak your website on a regular basis. But start with strong fundamentals and a clear strategy, and those changes will be part of the natural evolution of your web marketing plan. Not a scrap-and-start-over project. Here’s to looking “for you”.